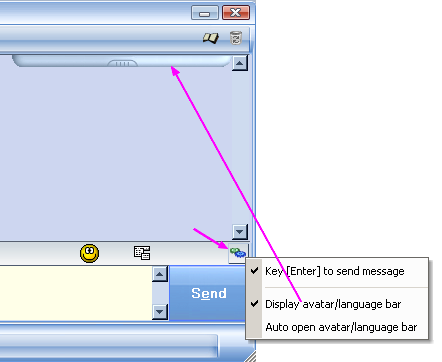 IntraMessenger • View topic - [Solved] How to hide drop-down (avatar/language) box ? [Solved] How to hide drop-down (avatar/language) box ? 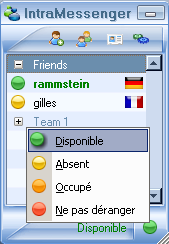 When chatting with someone, is there a way to eliminate the drop-down box that displays the time, country and language? On longer posts, the text is hidden behind the box, and I have to click the drop-down box, which pushes the text over so I can see the rest of the message. If it can't be done, is there a way to make the text not line up behind the drop-down box? Thanks! I just add an option (new button/icon on the right : clic to open contextual menu...). Re: How to hide drop-down (avatar/language) box ? I will try it on Monday and report back. Thanks! Thanks also for the very helpful screenshot! If you clic to open, after close will hide (after 3 seconds). It works perfectly! You're a genius! Thanks very much! !